After Thanksgiving, I always think about the dishes I serve and imagine what else I could do with them. Antique Broccoli is an old family favorite side dish that I love. So I had a brainstorm - why not add some meatballs to that recipe and transform it into a main dish? 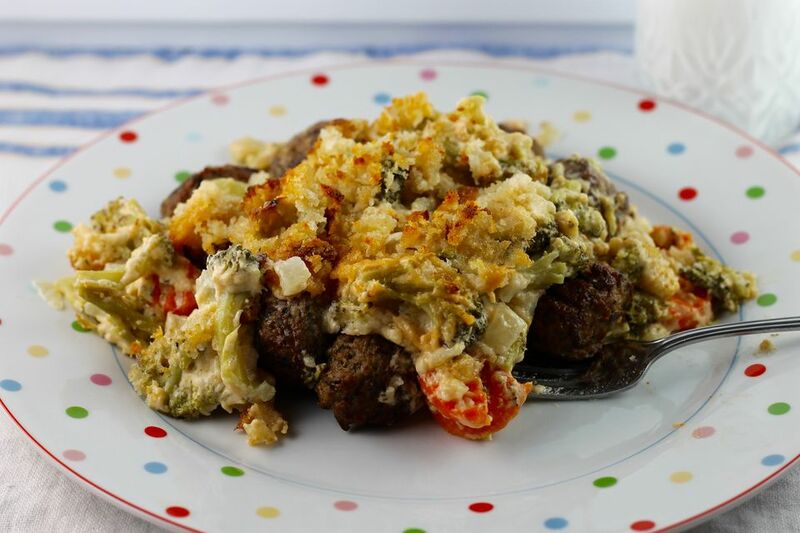 The tender vegetables, cheesy sauce, flavorful meatballs, and crunchy breadcrumb topping all combine to make an incredibly good main dish. I added a bit more sauce because the meatballs take up extra room in the dish. One tip: do not use chopped broccoli in this recipe. You need the bigger broccoli florets so they hold their shape during all of the cooking and baking. All you need to serve with it is a green salad tossed with some avocados and grape tomatoes and drizzled with a balsamic vinaigrette. This recipe is really a meal in one: you have the vegetables, meat, and bread. Add a glass of white or red wine and a bakery pie for dessert for a wonderful and simple meal. Preheat the oven to 350°F. Spray a 9" x 13" glass baking dish with nonstick cooking spray and set aside. In a large skillet, melt 1/4 cup butter over medium heat. Add the onions and garlic and cook, stirring, until the vegetables are tender, about 4 minutes. Add the flour and cook, stirring with a wire whisk, until the mixture bubbles for 1 minute. Do not let this mixture brown. Add the milk, salt, pepper, and marjoram leaves. Cook and stir over low heat until the sauce thickens. Stir in the Havarti and Colby cheeses until the sauce is melted and the mixture is smooth (except for the vegetables, of course). Add the meatballs, broccoli, and carrots and mix gently. Pour the mixture into the prepared baking dish. In a medium bowl, combine the bread crumbs, Parmesan cheese, and melted butter and mix. Sprinkle over the casserole. Bake for 30 to 40 minutes or until the casserole is bubbling and the bread crumb topping is brown and crisp. Serve immediately.